Everyone loves to disagree with their partner every once in a while right? Getting along too well can turn into complacency, and having a little disagreement then reconciling is often a moment which brings people closer together, right? This, however, might take a bit of time to get over. 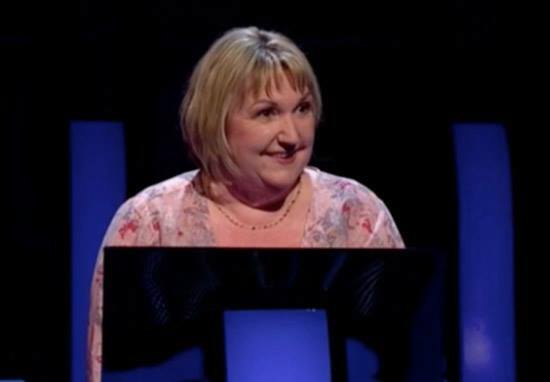 Appearing on the new series of Who Wants To Be A Millionaire, contestant Lynn had made it all the way to the £32,000 mark. Faced with the question of: Who did Boris Johnson succeed as Foreign Secretary in 2016, Lynn was scratching her head and, having used up her other lifelines, she only had one option left – ‘phone a friend’. Understandably, the friend was her husband, but even in her hour of need Lynn, for some reason, didn’t go with her husband’s sage advice. Perhaps she didn’t trust his answer, perhaps the thought of doubling her money meant nerves got the better of her, or perhaps she was looking to stir things up between her and her husband who, if she was right, would’ve happily admitted defeat, who knows? May I make a suggestion – don’t go home tonight. 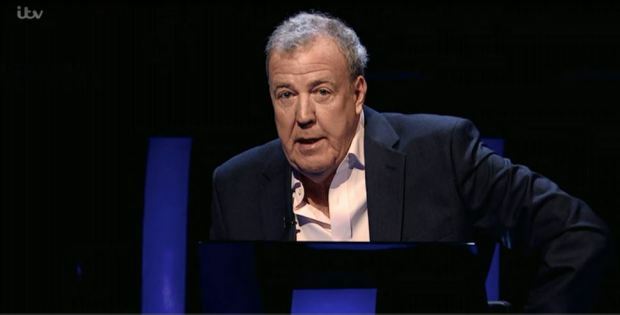 Love Clarkson – but has he known the answer to any of the ask the host questions this week? ?#WhoWantsToBeAMillionaire ??? The choice of Clarkson as host came as a surprise to a lot of people. Since his infamous ‘fracas’, which resulted in the end of his reign at Top Gear, he’s been confined to Amazon Prime. #whowantstobeamillionaire I think people need to get a grip, if you don't like Jeremy Clarkson don't watch the programme, there are plenty of TV channels to entertain you. Personally I think he is smashing it ? Fortunately for our Lynn, she’s not alone in winning a minimal amount of money. In fact, some cocky contestants don’t even get past the first question. Remember Brenton? He bailed pretty early on in the US version of Who Wants To Be A Millionaire after suggesting twenty-somethings take ‘kitchen selfies’ in Rome instead of Ikea. Oh, I’m going to go with B on that one Eddie, anniversary ring. Although Burger ring is an interesting one. 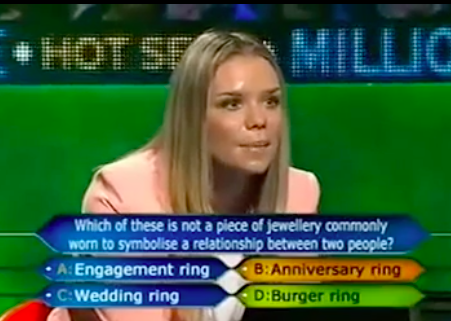 And to make matters worse, Whitney didn’t quite pick up on host Eddie McGuire’s hints, who urged her to have another look at the question. It’s yet to be revealed whether ITV will carry on with the new version of the show after this week of special 20th anniversary episodes but, with Clarkson in the chair and the calibre of current contestants, there’ll undoubtedly be an endless stream of entertainment available!